Optimum Nutrition ZMA at SameDaySupplements.com® for lowest price. The Bigger Picture of ZMA: ZMA is a potent combination of Zinc, Magnesium, and Vitamin B6 show to increase muscle strength, size, and recovery when used in conjunction with intense weight training. Optimum Nutrition ZMA may also help you sleep better too, both thanks to its blend of active ingredients and because of the peace of mind you gain from knowing that we only use SNAC System, Inc. ZMA-the only zinc-magnesium formula support by published research. Because athletes and active adults have greater nutrient needs than inactive people, Optimum Nutrition ZMA provides more than ample amounts of Zinc, Magnesium and Vitamin B6. This novel Zinc Monomethionine Aspartate formula can help fill gaps in your micronutrient intake. 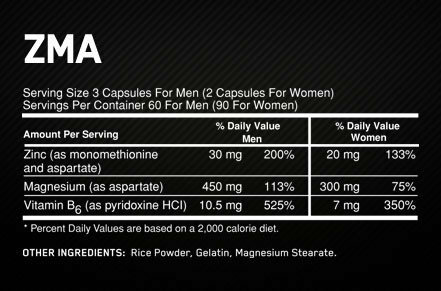 What's In Optimum Nutrition ZMA? Take 3 capsules of Optimum Nutrition ZMA, preferably on an empty stomach, before bed. Take 2 capsules of Optimum Nutrition ZMA, preferably on an empty stomach before bed. Este é o melhor ZMA do mercado. Superior ao T-UP da Nutrex e do ZMA da Universal Nutrition. We have a large selection of in-stock OPTIMUM NUTRITION products including Sleep Aid items and others for the lowest prices at SameDaySupplements.com® It's always easy to shop for Optimum Nutrition ZMA at SameDaySupplements.com because you can browse by reviews, brand, prices or search for specific ingredients using our search tool. In-stock orders placed before 3pm EST ship out the same day to USA, Brazil, United Kingdom, Canada, Germany, Australia, Japan, India, France and worldwide at the cheapest prices online.